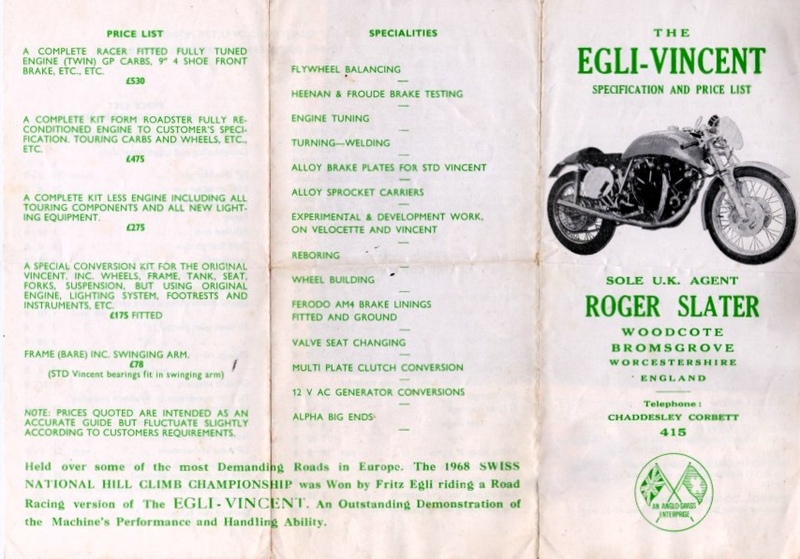 When Fritz Egli started his business, interest for his new frame concept was quickly growing beyond Switzerland, and the UK became naturally the main export targeted country as being historically the largest market for the Vincent. 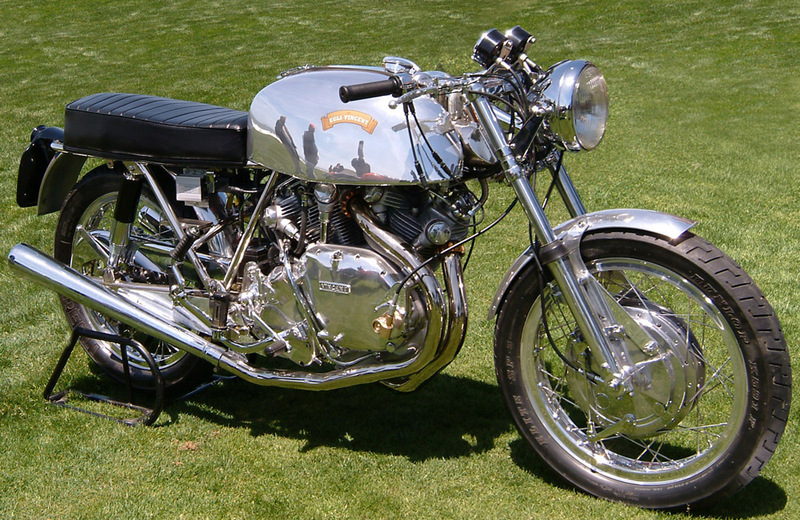 As soon as 1969, Fritz Egli appointed Roger Slater as the official Egli distributor in Great Britain and Slater imported frames to finish the assembly in his own workshop; then he started to build himself the frames under license to finally develop his own design known as the Shadow 70, using frames built by Eric Cheney. While the 2 first steps are considered as genuine Egli machines, the third kind is not. 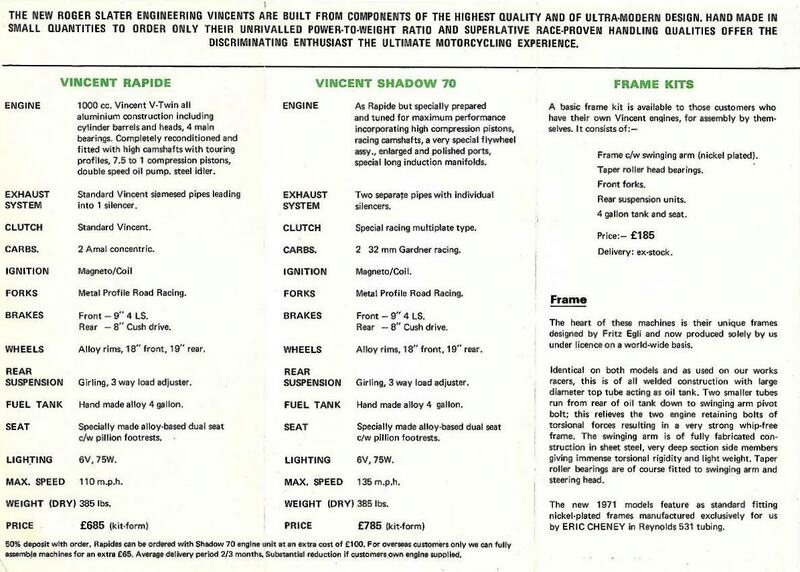 The original Slater price list back in 1969. A complete rolling frame cost GBP 175. The 1971 Slater flyer. The most important information on this document is that the mention to EGLI is gone. From that step, the chassis were made by Eric Cheney and those cannot be considered as genuine Egli. The 1971 Slater flyer. The most important information on this second page is that the sourcing is now from Eric Cheney. A pre-Shadow 1970. 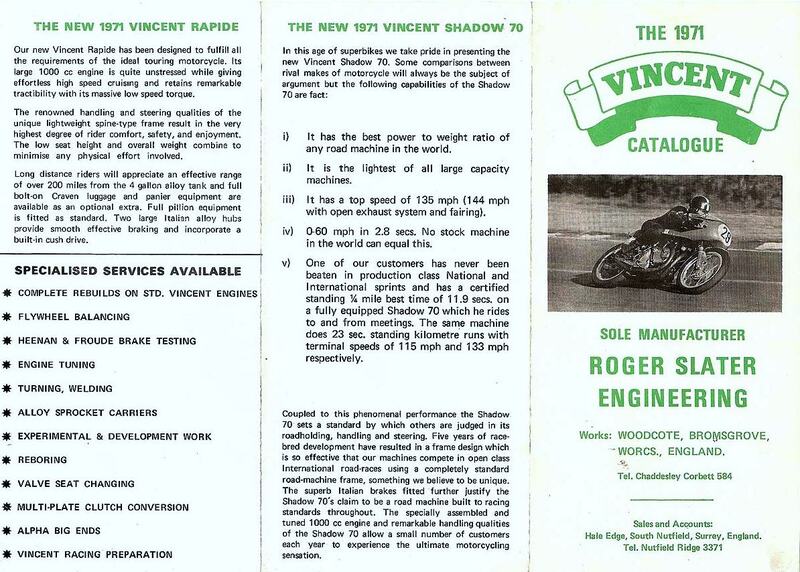 This first batch was coded “RSC***” opposed to “VIN***” for the Shadow 70. However the specification was identical. One of the finest Shadow 70 made by Slater and owned by Dale Keesecker. Mossey was never in partnership with the Hailwoods. 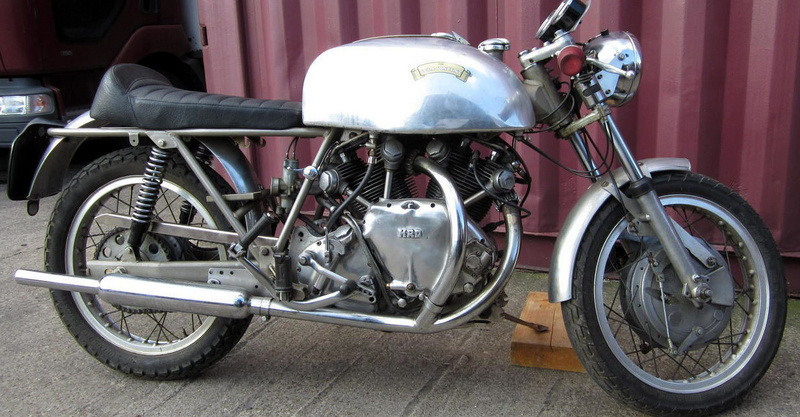 Mossey was removed from John Mossey Restorations and new investors were brought in and the relationship with the Hailwoods was built which lead to the renaming of the business. 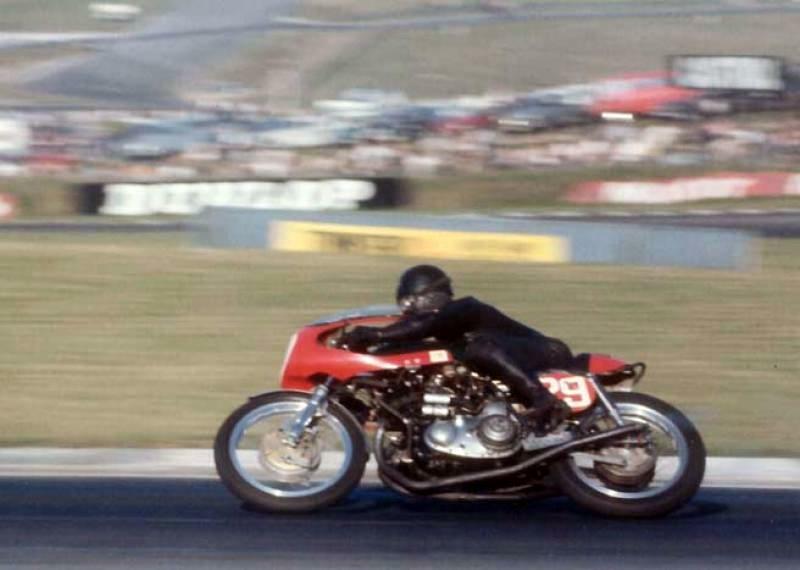 The Hailwood Motorcycle Restorations business lasted over 1 year before the investors closed it down. Dear Mike, that you for contributing to this blog. If I understand what you say, JMR assets and management was taken over by investors which removed John Mossey. The investors developped the relationship with the Hailwood and rebranded the business and bike HMR for about one year before business was closed down. In paralel John Mossey established JMC and resumed the production of the motorcycles that manufactured in the previous structure. Is that correct? Last point, how the “Egli” and “Norvin” trademarks rights jumped from HMR to JMC?